Paradise Post Printing is truly a commercial printing company and not just another newspaper that prints commercial work. 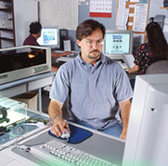 Paradise Post Printing has been a dominant force in the Northern California market because of its reputation for high quality work and superior customer service. We are the only printing company in Northern California to offer heatset web in combination with coldset web simultaneously through the same folder. Paradise Post Printing offers a full spectrum of quality web printing products and additional services that provide a complete turnkey solution for its loyal and diverse customers.